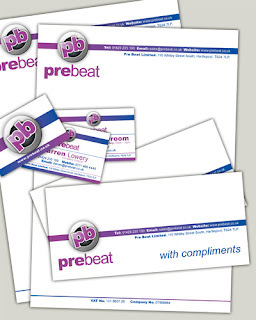 Pre Beat Ltd. contacted us after finding us on twitter, shortly after out SBS winning re-tweet by Theo Paphitis. They had an existing logo that was colourful on screen, but when printed looked flat. We discovered that the logo was designed for screen in RGB and when converted to CMYK used colours outside of the printing gamut, causing the colours to become dull. 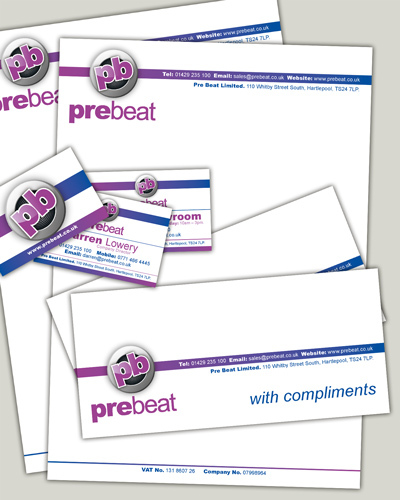 After supplying Pre Beat with some print safe colour alternatives, we progressed onto the stationery design, which again we designed with print-safe colours in mind, giving the client a reassurance that what he was seeing on screen, would be replicated on paper. Full Fat Designs was founded by two designers who share the same passion for great functional design. With over 25 years combined experience in print design and more recently in websites and video effects, Full Fat Designs can meet and exceed your design requirements. High standards, creativity and passion are applied to all projects taken by Full Fat Designs who live by one rule, that there should be no half measures.